This new hi-tech helmet has been specifically designed for professional work-at-height and work-at-ground application. It is lightweight, compact, comfortable and well-ventilated with its 10 air intakes that that provide efficient cooling and ventilation. The air intakes on the outer shell are equipped with the protective aluminum anti-intrusion grille that prevents entry of debris into the helmet. The helmet’s outer shell is made of High Density ABS Plastic and designed to withstand significant impact from the above or side (meeting the requirement of CE EN 397 and CE EN 12492 standards). The helmet’s inner shell is made of High Density (HD) Polystyrene and has ducts that allow natural air flow and heat recycling. 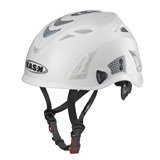 Four fastening points chinstrap is designed to decrease the risk of helmet loss in case of an impact during a fall. (breaking strength of more than 50daN or 112.4 lb, CE Its safety release system allows quick fastening and opening of the locking mechanism. Provided with a special red-colored ring on one of the straps for fastening helmet to a harness. Provided with the external lamp carrying clips made from strong Nylon 6.6 that are compatible with all head lamps available on the market. Accessories include Visor (Clear, Smoke and Mirror) Ideal for tree climbing, forestry, logging, rescue climbing and other similar work activities. - Improved safety is provided by the increased shell’s thickness in the summit area and by the extended shell’s contact surface with the head in front and rear parts of the inner shell. - Increased natural air flow due to the vents in the inner shell’s summit area that provide efficient ventilation and air recycling. - New Polygiene treated 2DRY fabric offers greater freshness and active protection from unpleasat odour even after frequient wearing. The high-tech wool fabric provides maximum comfort and rapid absorption of moisture keeping the skin fresh and dry. - Chin pad is made from the leatherette - artificial leather. It’s anti-allergic, washable, extremely comfortable and eliminates irritation of the skin. - New and proprietary Up-N-Down size adjustment system provides the most precise and comfortable fit. Its mechanism consists of a central ratchet wheel and two lateral ?nger-push winglets that allow rapid and exact adjustment of the size. The advanced size adjustment system offers increased stability of the helmet due to two additional adjustments of height and inclination, allowing correct positioning and ultimate fit of the helmet. - New visor mounting system is made of polycarbonate and allows two positions: Up – on top of the helmet and Down – working position. - Certified ANSI Z87.1 - 2010. WARNING: Plasma Work does not meet requirements of the CE EN 397 and ANSI Z89.1-2009 standards regarding electrical insulation. Plasma Work is Type I Class C helmet based on ANSI Z89.1-2009 classification.